Well I finally got the energy and motivation to see Adam Sandler’s newest endeavor into screens across the country with Pixels. The longtime comedian has had a lot of low quality and flat out terrible films over the past few years. 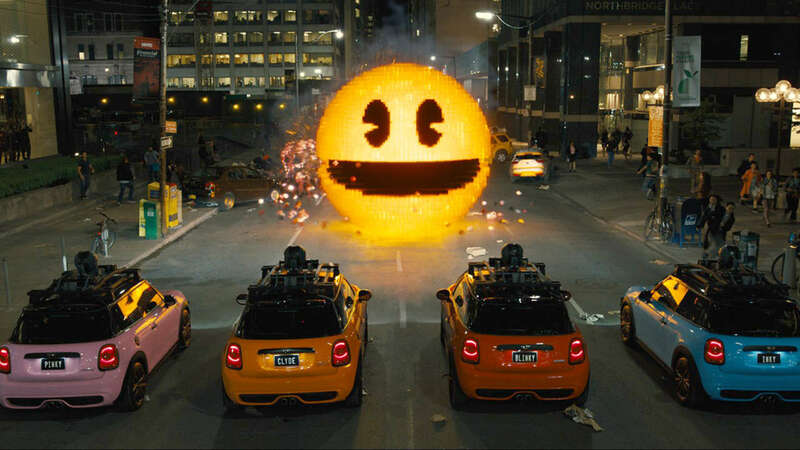 Now Pixels is by no means good, but lowered expectations certainly make it watchable. Sam Brenner (Adam Sandler) was a champion video game player back in 1982, second only to his rival Eddie Plant (Peter Dinklage). Despite his wondrous days of youth, adult life hasn’t treated Brenner well. While his childhood buddy Will Cooper (Kevin James) has become the President of the United States, the once great Brenner is nothing more than a tech help guy. His job leads him into contact with recent divorcee Violet van Patten (Michelle Monaghan), who just so happens to be an advisor to his buddy, the President. Once an attack occurs at an Air Force base in Guam by what appears to be video game characters, Brenner is brought in for his expertise. The military is at a loss for what to do thus entrusting Brenner, Ludlow (Josh Gad) and the rest of the “nerds” with saving the world. The story is based off of a short film from a few years ago in which video games emerge from an old television and begin attacking the surrounding areas. It works very well in the short, but stretched to the length of a feature film might be just a little too much. Of course those are the fun parts of the film though. What makes the film watchable is seeing the old video game characters wreak havoc to the real world. 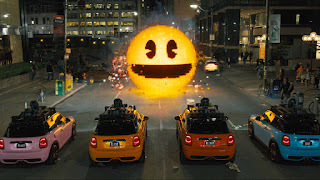 When characters like Pac-Man or Centipede are on screen the movie is actually enjoyable. Unfortunately there are scenes in between that take a little life away one by one. Sandler is in true fashion here, appearing as a slightly different version of himself as always. Nothing much can be said about his clearly send it in performance. Kevin James is surprisingly bearable as the POTUS, though only bearable. He still plays the bumbling idiot he does in most comedies, but manages a few laughs from his inability to run a country. And of course there is Michelle Monaghan. While she herself is fine in her role, it’s clear she is just there to be the romantic interest, who in no way should be interested or has any reason to be interested in her suitor. The clear mark of any bad film is when even good actors can’t redeem the film during their screen time. Gad and Dinklage are two of the worst parts of the movie, despite being two of the better actors. Gad is constantly yelling and the awkwardness of his character gets old, while Dinklage sports a strange accent with a quite hollow and semi-villainous character.